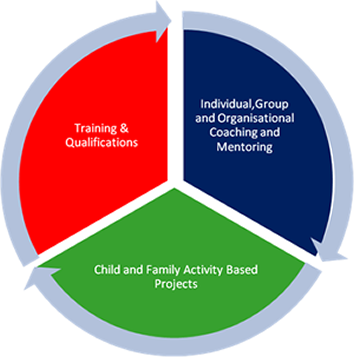 Innovate Volunteering's Service Wheel includes the 3 areas of delivery that enable us to carry out our mission of empowering people. The areas include training, coaching and family and community projects which is all underpinned and enhanced by a golden thread of volunteering! Our training courses and qualifications are dynamic, inclusive, fun and relaxed. All our courses aim to instil confidence, knowledge, and self belief, therefore empowering the learner. Our range of coaching services enable individuals, families, communities and business to embark on a journey of self discovery and development enabling them to reach their full potential.